I’m going to go way out on a limb here and suggest this isn’t the sort of opening you’d expect from, say, a Martha Graham dance concert. Then again, this is BodyVox, not Martha Graham, and in the world of BodyVox, where the view of American cultural history skews more through Mark Twain and James Thurber and Bee Bop a Lula and the vaudeville stage than through the Valley of Earnest Transcendental Gestures, the only surprise about a dance concert filtered through the TV game show Wheel of Fortune is that it’s taken the troupe 18 years to come up with it. After all, BodyVox operates under a couple of core assumptions that color its aesthetic approach: “entertainment” isn’t a dirty word, and humor is important stuff. So, this is how The Spin landed on its opening night Thursday. 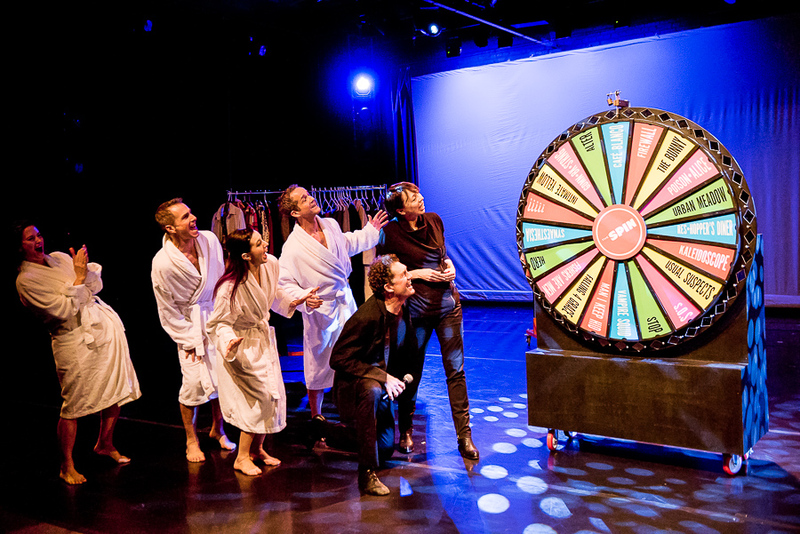 The company’s nine dancers rehearsed 24 pieces – about 150 minutes of dance in all – from the repertory, and each title was entered in a slot on the giant spinning wheel, which multitasking stage hand Clark Young, sporting a bushy Portlandia beard and a shoulderless dress and answering to the name Manna White, rolled onstage between pieces. Hampton then cajoled someone in the audience to come on up and give ’er a spin. Then, depending on where it landed, the performers rushed to change into the proper costumes while Hampton, sometimes joined by his wife and co-company founder Ashley Roland, filled in the time with what the nightclub crowd refers to as “patter.” Sometimes it was a little story about how that piece came to be created. Sometimes it was a little bio about one or another of the dancers. Sometimes it was just … patter. Gimmick? Why, yes, this was a gimmick. But so what? It broke down the barrier between audience and performers – something that arts groups have been desperate to do – and let everyone know it was OK to just relax and have fun. And it was a December show that felt light and cheerful like a holiday show but wasn’t specifically about a holiday at all. For BodyVox regulars, it brought back a lot of familiar pieces without feeling like a rehash; for newbies, it gave a sense of the company’s identity. The scrambling became part of the act. On opening night, the spinning pointed the way to seven pieces – S.O.S., Intimate Yellow, Stop, The Usual Suspects, The Bunny, The Man I Keep Hid, the trio A Good Man Is Hard To Find + Write My Book + Hello Stranger – in addition to Bollywood, which the company chose on its own to open the second act. That left 16 pieces rehearsed but unperformed. Maybe they’ll get lucky another night: the show continues through December 19, and every performance, barring a statistical near-miracle, is going to have a different lineup. While the changes could be a little clunky and the performances weren’t always as sharp as they’d have been if the program had been more rigorously selected and rehearsed, that really didn’t matter: the sense of scrambling was a good part of the fun. The BodyVox approach of surprising group movement, high and low comedy, crisp storytelling, and deft use of props was on full display, and the program offered a chance to appreciate the current company’s blend of freshness and experience. Four veterans – Hampton, Roland, Eric Skinner, Daniel Kirk – were joined by the younger Alicia Cutaia, Brent Luebbert, Anna Marra, Katie Sherman and Scott Stampone, creating a nice tension of friskiness and restraint. Marra in particular showed off a sly comic streak Thursday night. 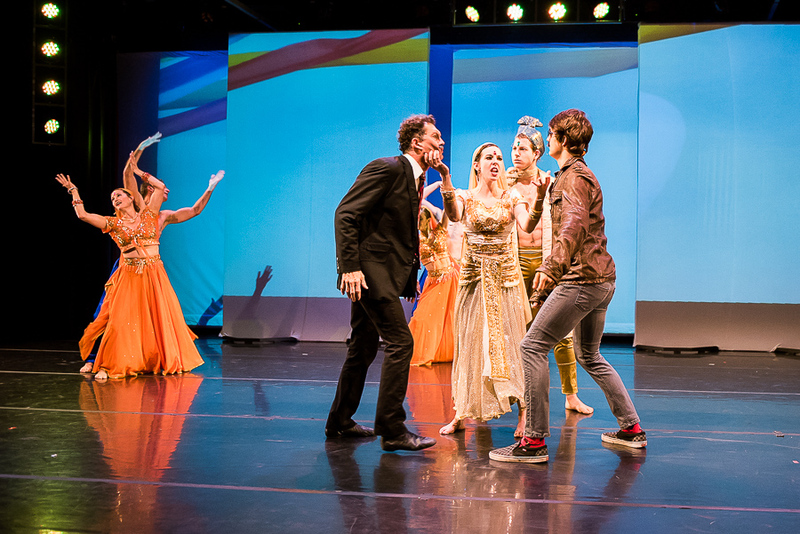 The program also underscored BodyVox’s canny ear for excellent music, in a variety of forms. Thursday’s mix included the likes of Tom Waits, Joe Henry, the Latin Playboys (for Roland’s absurdly funny Bunny), 3 Leg Torso, John Adams, and Jean Sibelius (for S.O.S., an elegiac and moving piece based on the sinking of the Titanic, with the dancers swimming and swimming and swimming against hope). Audience members walk into a performance carrying all sorts of baggage in their heads, and on Thursday night mine included some deep brooding on the previous day’s mass murders in San Bernardino, and an increasing hopelessness over what’s become an American state of being, and the revelation that the killers this time were not Christian terrorists or Southern racists or angry white guys with a grudge, but angry Muslims with possible ties to ISIS, and the awareness that that was only going to throw more fuel on the fire of xenophobia and prompt more Americans to arm themselves up past their teeth and beyond their eyeballs, and that I have utterly no idea how we quell the dark strain of violence that is part of our history and has grown stronger and more virulent, upending our private lives and dominating our public discourse, which is really no discourse at all but a cynical shouting match. No work of art can solve such questions, and as I was watching The Spin, curiously, my mind stayed locked on the dark strain. At the same time, it responded anew to what’s always been one of BodyVox’s greatest strengths – its devotion, consciously or unconsciously, to another, possibly greater, strain of American history, the inherent optimism that shines through in the humor and invention of its music and dance and restless popular culture. And it made me think, not for the first time, that one of the best responses to evil we have available to us is simply to refuse to give in; to develop the instinct of laughter and the freedom to be irreverent. The best of popular culture has long played a role in that, and may help us through yet again. So maybe Skinner, hopping and pouting and comically running away in The Bunny, is a balm to a traumatized land, reenergizing run-down psyches and lightening numbed spirits. Maybe our comedians really are our holy fools. The Spin continues at BodyVox through December 19. Ticket and schedule information here.